I spent last week in the Sultanate of Oman, working with my colleague Professor Anne Rasmussen to setup a William & Mary study abroad program that we’ll run in January 2016. For much of the trip we were based in Muscat, meeting with our Omani colleagues to hammer out program logistics. With each passing day I grew more restless to get into the field and examine Oman’s iconic geology. On my last day in Oman I was rewarded with a spectacular outing that culminated in a visit to the Moho. Just what is the Moho? It’s a euphonious word that’s short for the Mohorovičić discontinuity. In 1909 the Croatian scientist Andrija Mohorovičić recognized that seismic waves generated during an earthquake near Zagreb were reflected and refracted across a boundary deep in the Earth. Below this boundary seismic waves traveled ~30% faster than they did above the boundary and Mohorovičić rightly concluded that the Earth is layered with rocks of differing compositions framing the discontinuity. A schematic cross section through oceanic crust and mantle. Although originally described as a seismic discontinuity, the Moho is today considered to be the boundary between the Earth’s crust and mantle– it’s a fundamental planetary boundary. 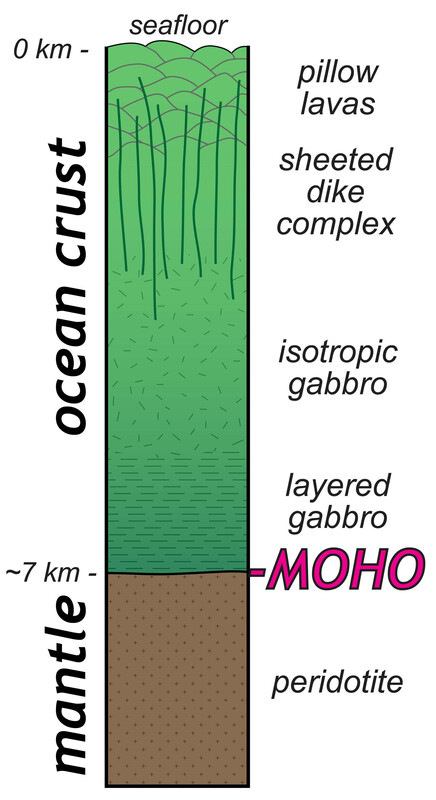 However, the Moho is many kilometers below the Earth’s surface and not readily visited on field trips, earth scientists have yet to even drill down to the Moho (as it occurs at depths of 30 to 50 km beneath the continents and 5 to 7 km in the ocean basins). But much of Oman is underlain by ophiolite, a slab of oceanic crust and mantle that was tectonically emplaced onto the Arabian continent in the late Cretaceous, which affords opportunities to see an ancient Moho in outcrop at the Earth’s surface. I was joined on this outing by Michelle McMahon, an American geologist teaching in Oman, who was more than game to journey to the Moho. 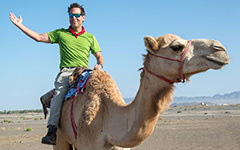 Michelle’s been capturing Oman’s geology in a series of exceptional GigaPan images. The road to the Moho starts as a lovely paved track leading to the village of Subaykhah in Wadi Abyad, there the tarmac (asphalt) ends. 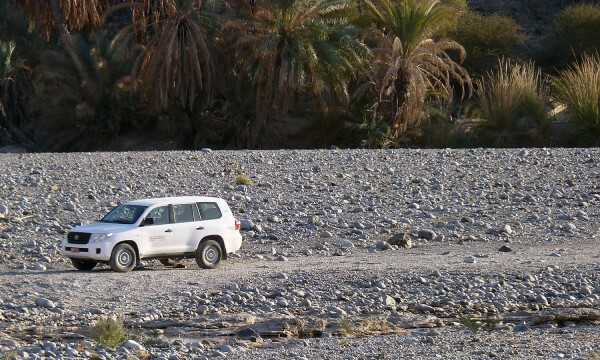 From the village the road angles across wadi gravels and a 4-wheel drive vehicle is the prudent choice. After a rollicking 5-km ride down the wadi the road to the Moho petered out, from here we hoofed it. Our Land Cruiser parked in Wadi Abyad, Oman near the end of the passable track on the Road to the Moho. We hiked swiftly and with purpose, hoping to reach the Moho and return before darkness enveloped Wadi Abyad. Two kilometers later we found ourselves at a swimming hole framed by outcrops both in the stream and along the wadi slopes. We’d been walking through a sequence of serpentinitized peridotites, ultramafic rocks originally formed in the mantle. North of the swimming hole, layered gabbros crop out – these are igneous rocks formed at the base of the crust. We’d crossed the Moho! Simplified geologic map and cross section from part of the Oman (Semail) ophiolite. Modified from the Open University Oman Ophiolite Project Map (1983). Click on the image to enlarge the map. Perhaps it was just the late afternoon light, but the contact between ancient ocean crust and underlying mantle rocks seemed aglow. Originally this discontinuity lay ~10 kilometers below the sea surface of the ancient Tethys Ocean, an elaborate sequence of geologic events had conspired to expose the Moho here in the mountains of northern Oman. Two young Omanis enjoying a swimming hole at Wadi Aybad and the well-exposed ancient Moho in the outcrop. Annotated image below. 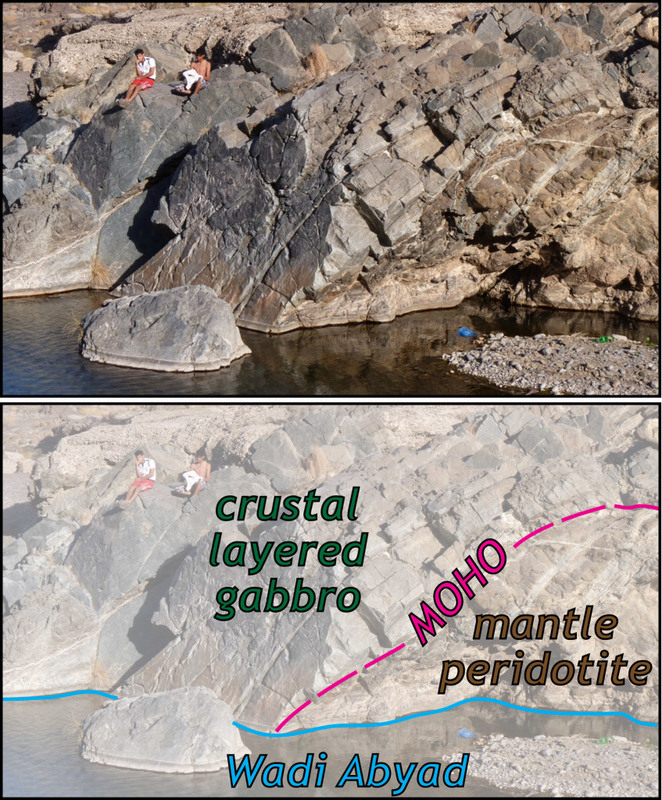 Geologists have learned much about the Moho by studying outcrops in Oman; it’s a complex boundary, sometimes a transition zone hundreds of meters thick and at other locales a sharp contact. There are even two Mohos: a seismological Moho and a petrological Moho, but that’s a topic for another time. Just hours after visiting the ancient Moho exposed at Wadi Aybad, I was on an airplane winging through the night sky, headed for home and a new semester at William & Mary. Once again, Oman’s world-class geology made the long trip well worth the effort. This is so cool – thanks for sharing, Chuck! Love your blog! We went back to the N exposure on Monday. Amazing stuff. Will send you some pictures! do you have coordinates, perhaps on a picture taken with a camera featuring GPS? I am just at the start of my geological knowledge, strongly interested to learn and understand more. 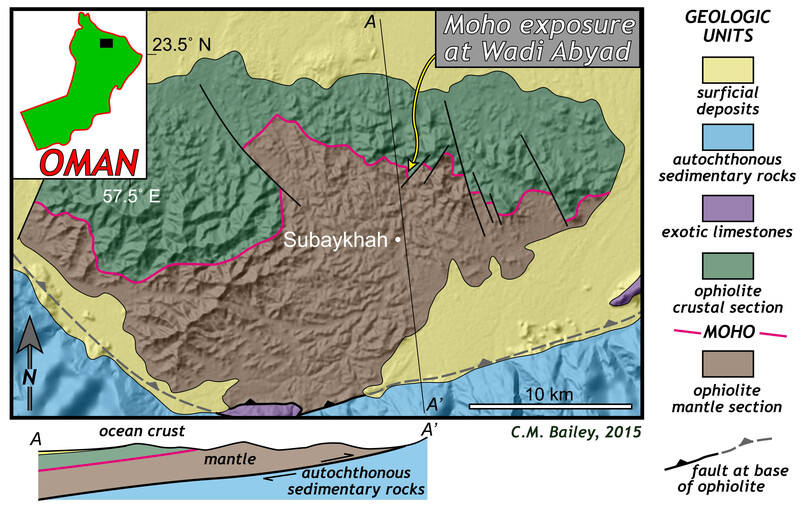 I will be taking a walk through Wadi Abyad later theis Feb and would like to be well prepared, not missing the Moho layer. Oh – thats Mohammed Ali – is he still locked up after his conviction for major fraud in Oman?